1. Alpe d’Huez, France – a superb resort for all abilities with an excellent snow record and an abundance of varied pistes. From challenging black runs down the Pic Blanc glacier to wide-open blues and greens, there is plenty of fun to be had for skiers and boarders alike. There are also a whole host of activities in resort including swimming, ice-skating, dog sledding and curling. 2. Zell am See, Austria – this pretty lakeside town is ideal for those seeking a larger resort – it has a traffic-free medieval centre with excellent shopping and an array of cafes and restaurants. Linked to nearby Kaprun, Zell has plenty to offer especially for intermediate and advanced skiers with both scenic pistes and exhilarating glacier runs. There are also some gentle blue runs for those who need to build up their confidence on the slopes. The resort offers a range of activities for the whole family including swimming, tennis, bowling, horse-riding and ice-skating. 3. Bad Kleinkirchheim, Austria – this picturesque ski and spa resort is perfect for a relaxing family getaway and offers plenty of perfectly groomed pistes for beginners and intermediate skiers. Experienced skiers will love the opportunity to carve down a World Cup run with the famous downhill racer – Franz Klammer, too. The resort boasts two thermal spas and miles of cleared paths for winter walks. You can also try ice-skating, tobogganing and snowshoeing or explore the resort by horse-drawn sleigh. 4. Kranjska Gora, Slovenia – set against the majestic backdrop of the Julian Alps, the picturesque village of Kranjska Gora is ideal for a family holiday. The resort offers excellent ski tuition for first time and improving skiers, with plenty of blue and red runs to keep you busy. You can also try cross-country skiing, snowshoeing or ice-skating. 5. Les Deux Alpes, France – situated on the edge of the largest skiable glacier in Europe, this snow-sure resort has plenty to offer for intermediate and advanced skiers as well as boarders. Unusually, the higher ski areas of the glacier are less challenging than the lower slopes down to the resort which means beginner skiers can enjoy glacier skiing whilst building up their confidence. The resort has an impressive number of shops, bars and restaurants as well as a host of outdoor and indoor activities for the whole family to enjoy. 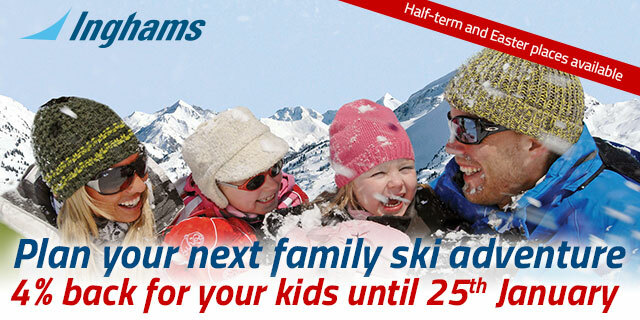 If you can’t wait to take your family to the slopes, Inghams have some fantastic deals available for the half term with savings of up to £360 per person and convenient flights from Gatwick, Manchester, Bristol, Birmingham and Edinburgh. Choose from self-catering apartments, catered chalets and hotels and enjoy 7 nights skiing from £744 per person. For those who like to plan ahead, there are also some superb offers for Easter and early booking discounts and free kids places for Winter 2015/16. As one of the nation’s favourite tour operators, Inghams boasts 80 years experience in providing holidays with a difference. Their programmes include Ski, Lakes & Mountains holidays as well as Santa Breaks and Christmas Markets city breaks – each featuring a comprehensive selection of resorts and quality accommodation. The package holiday prices include flights, transfers and accommodation (typically on a half-board basis) as well as a host of added value offers such as free packed lunches, free afternoon tea, free excursions and discounts on local attractions (offers vary – please refer to the website for more details). For your peace of mind, all package holidays available from Inghams are financially protected by the Civil Aviation Authority, ATOL 0025 and ABTA – The Travel Association (ABTA V4871).